Motorcyclists enjoy the freedom of the open road and the ability to go places where four-wheeled street vehicles normally cannot go. But riding a motorcycle, like using any other piece of equipment, has safety concerns that every rider should be aware of. Before you head out on the open road, make sure that you understand what your responsibilities are for making sure that your ride is safe and fun. 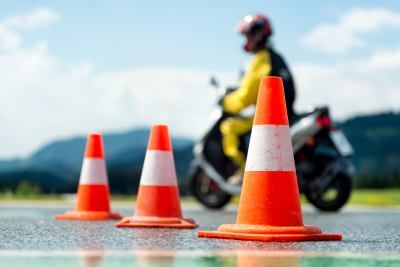 Many of the safety tips you need are covered when you get your license to operate a motorcycle. But there are still plenty of things you can do to make sure that you get to where you are going safely. If you are planning on heading out on a brand-new bike, then take the time to get to know the bike before you hit the road. Go to an empty parking lot and become completely familiar with your bike before taking it out into traffic. When you are getting used to your bike in a controlled setting, you will be able to gauge the sensitivity of the brakes and get a feel for the clutch. All of this is extremely important when it comes to being able to maintain control over your motorcycle at all times. A motorcycle is a piece of machinery that requires regular maintenance to run properly. Before you head out on a long ride, take care of regular maintenance to make sure that your bike is prepared to handle the trip. Your motorcycle manufacturer's manual will tell you when and how to perform other routine maintenance. If you are unsure how to do the necessary maintenance on your motorcycle, then have it looked over by a certified technician on a regular basis. If you are planning a long motorcycle trip, then be sure to pack a first aid kit and extra clothing. You should also pack food, water, and some kind of protection from the elements in case you get caught in a storm. You should also have a solar smartphone charger with you in case your phone loses power while you are on the road. The more prepared you are for every type of possible emergency, the safer your trip will be. Most importantly, always wear the appropriate safety gear, including a helmet, no matter how long or short you planned trip might be. In order to safely operate your motorcycle, you need to have your weight properly centered on the seat. If you have a passenger, then your passenger also needs to be properly situated on their seat to allow you complete control. Never weave in and out of traffic, and avoid taking turns at excessive speeds. Follow all rules of the road: Signal all turns, and obey all posted speed limits, whether you're in the city or on the highway. Operating a motorcycle is much different than driving a car, and you need to keep that in mind when you are on the road. Safe driving and defensive driving are two different things. Safe driving has to do with making sure that you have good riding habits and give yourself every chance to be in complete control of your bike at all times. Defensive driving means being aware of people around you and making sure that you give yourself a chance to avoid accidents and other dangerous situations. Always be aware of the traffic around you and obey the rules of the road. Pay attention to any lane change signals other drivers are giving, and be aware of situations that may force a driver into your lane unexpectedly. Also, be courteous to those around you, and always yield the right of way when necessary. Never ride your bike if you are feeling drowsy or ill. If you have recently suffered an injury, then be certain that the injury does not prevent you from safely operating your bike. If you know that your cargo and passenger go beyond the safe weight limit, then make arrangements to reduce your cargo or find another ride for your passenger. If the weather gets bad, then consider pulling over and allowing the weather to pass before moving on. Do your best to avoid bad situations and maintain your status as a safe motorcycle driver.